Flavor Sprays - Great Taste & Zero Calories! Those who haven't heard of and tried the Flavor Sprays from the award-winning chef David Burkes, you are seriously missing something! When I first read about them, I was intrigued and attracted at the same time - it's such a great idea to use Flavor Sprays which can enhance flavor of anything you eat, without adding tonnes of extra calories that generally go hand-in-hand with indulgent recipes! It is no wonder then, that people have caught up to the Flavor Spray Diet - you can actually eat the healthy food you need, without missing on the great flavor factor! These sprays are safe and contain absolutely no fat, no carbs, calories or cholesterol! They work with any and every type of food - so what are you waiting for? Spray some flavor into your nutritious food, and you can pamper your craving, without gaining any extra pounds or disturbing your diet plan! 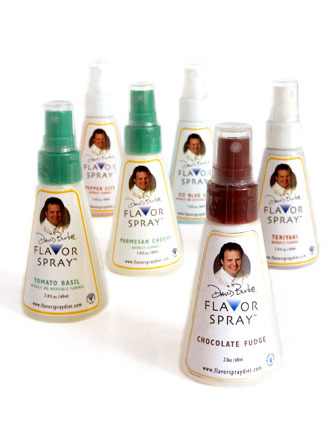 David Burke, a renowned chef, restaurateur and cookbook author has introduced a line of zero-calorie Flavor Sprays to enable people to put more flavor into diet food like steamed vegetables, boiled eggs, or plain fruits and turn them into tasty concoctions. These are especially formulated for those who are on a low-calorie diet, so they can still cater to their cravings by trying to assugae them using these calorie-free, fat free, carb-free Flavor Sprays. Flavor Sprays come in 35 flavors, and range from sweet and savory, both naturally-flavored and a combination of natural and artificial. Anybody on any diet or food plan can use the sprays. Though it was introduced a some time ago, it is only recently that the craze has increased. I watched an episode about these on Food Network, and decided to try a couple flavor bottles myself. The basic idea of using Flavor Sprays is not to substitute actual fresh ingredients, but only to use it as a zer-calorie flavor enhancer on drab or plain foods. Instead of actual cheese, use Parmesan Spray, instead of Chocolate Sauce, spray 2-3 squirts of Chocolate Truffle flavor and your milk might taste better than before! With innovative flavors to choose from like Bacon, Bleu Cheese, Chocolate Fudge, Banana, Cookies & Cream, Memphis Bbq and many more, you can even combine certain flavors together to add the zing missing from your dish. However, as exciting as these may sound, they are not real flavors, and hence do not taste as great as the names make them look! I found that I had to spray a lot of Chocolate Truffle on my ice-cream to make it taste even close, but Cookies & Cream in my milk had a stronger taste than Raspberry or Banana; so it really depends on your taste, and also the strength in the Flavor Spray. Perhaps the Memphis BBQ or Teriyaki flavors might provide some variety to plain, skinned chicken and steamed or broiled fish when one has tired of all of the seasoned salts and citrus squeezes. It may also be a good idea to use these with kids, as this way you can give them the taste without all that sugar! Or use it on someone who has high cholesterol and loves Bacon - a dash of spray on eggs is all he may need! Flavor Sprays are a nice compliment to your diet routine, but they cannot substitute the actual ingredients. As David Burke says himself "The sprays do not compete with a gourmet chef or a balanced diet. Rather, they help in adding flavor to food without adding the fat and calories. They complement well-prepared food and a healthy diet plan." With this in mind, a $5.00 bottle of your favorite Flavor Spray can be enticing to try - I loved my Strawberry Shortcake and Cheesecake flavors; I'd urge you to try one yourself, as you might just find the flavor you were looking for! good info.. i didnt know this..should try them. i'm skeptical about the zero-calorie bit. PAM claims to be zero calorie only if you squirt it for 1/3 second. it has the same calories as oil. 1/3 of a second means less than 1 gram of fat per serving. so they can get away with the 'zero-calorie' label. i don't know of anyone who can squirt for just 1/3 of a second. am wondering the same about these sprays. yeah, I've used them in the past, didn't get too much flavor from them as you said, but they are pretty helpful for people who are on a medical diet! This is new to me.....lemme give it a try! What a great idea! I am a newly diagnosed diabetic and I am mourning many foods so this could give me the tastes that I am missing! Hey Mansi Welcome Back! !this is something really new for me and it sounds interesting.I always wonder from where do u find all these intersting information. Mansi- Thanks for sharing info about flavor sprays, have never heard of them before. Hope you had a wonderful vacation Mansi! I've seen an episode in Food TV reg. these sprays. I think it would help me with my chocolate cravings. This is a very interesting product...thanks for the info. Thats a nice way to include your favorite flavors without any calories..! !Great info!! Mansi, you post some really interesting and informative posts.i keep learning something new everytime i visit ur blog.